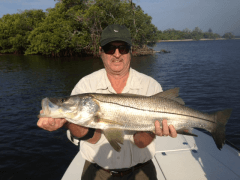 It doesn’t matter if you’re on a charter fishing boat with a local guide or if you’re out on your own, when you hook into a Snook you know it. 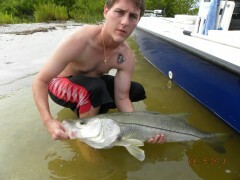 Snook fishing around the Sanibel Islands is my favorite thing to do. So, here comes September 1, 2013 and the Snook season opens back up. Some are for it, some say the population hasn’t had enough time to rebound from the freeze of 2010. Reports from that freeze say we lost as much as a third of our population of the Snook species. If you were out on the water after the freeze you’d guess that at least a third was lost and probably more. It was a huge loss. So now it’s up to us to help manage the fish that’s loved so much and does so much for our waters on the West Coast of Florida. I know it tastes good but I think we love to kill a Snook because we’re men. That’s what we do. We like showing who’s boss. 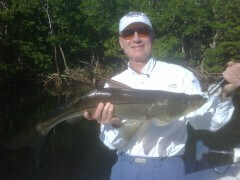 We’ve had three years of catch and release Snook fishing. We’ve all survived our manhood and we have pictures to prove it. Guess what, the pictures remain much longer than the fullness in our bellies so why not just keep doing what we’ve been doing and enjoy the fight, take the trophy pictures and help that wonderful species really make a rebound. Being a charter fishing captain I’ve listened to a lot of people talk about the population and it’s all across the board. I speak from 200 plus days of fishing on the water. 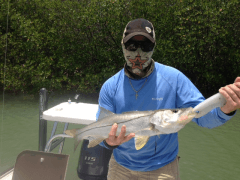 It’s much harder to find and catch Snook today than it was before the freeze. I’m a common sense major and believe studies and surveys are used to justify a decision and not always what is actually happening. All I can base my studies on is being on the water and seeing what we’re catching. That’s the reason I’ve come to the conclusion that we need to understand how much more fun it is to catch a Snook than it is to eat one. Enjoy some of my trophy pictures that my clients have enjoyed even without the harvesting of this great warrior.